There are two stories for every book–the story in the pages, and the story behind the pages. 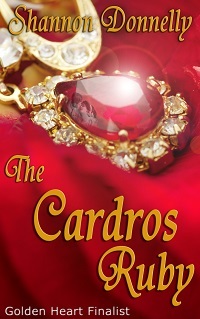 For The Cardros Ruby, it’s story is a long one, but I’ll shorten it up. Back in the day I’d written a story–this one–and it was good enough to final in RWA’s Golden Heart for Best Regency. That delighted me, and I went to Hawaii (and I doubt RWA will ever have a conference there again, since most of us really wanted to be on the beach and not in conference rooms). The book didn’t win, but a good friend (made at the conference), won and went on to sell–this book didn’t sell. Now there are always many reasons why a book might not sell, even a very good book. Back then the choices were traditional Regency publishing with strict word counts of under 70K, and Historical Regency romance, but those were going hot, and have since even gone hotter. This book didn’t fit either marketing category–it’s a long traditional Regency (with a bit of a mystery in it, but not enough to make it a mystery). So it was a book without a marketing category–that used to be death for any book. It was doomed to a shoebox life. These days, thank heavens, it’s a different world. So…an edit later, a read through by others, and a cover, and it’s now finally out in the world. The Cardros Ruby is–I hope–a bit of a throwback to the days when novels could be novels–when a romance could have some action, some history, some mystery, and just be a great read. Hopefully, it’s all that. After leaving home years ago amid scandal, Captain Desford Cardros has returned home to mend his wounds, and settle an old score with his brother. But he is drawn to a beautiful woman whose brother is the target of mysterious accidents. Now Cardros must choose between repayment for past wrongs, or a love that could be his salvation. Helena Seaford is ready to do anything to protect her only brother, even trust a scoundrel. But will she hold to her an upbringing that intends her to be a lord’s wife, or will passion lead her into scandal? As a killing frost holds everyone prisoner in the Yorkshire country, a fragile alliance will be tested by old secrets and lies. Ultimately, the truth may be found in the story of what did happen to the Cardros Ruby five years ago? Her eyebrow quirked high again, and her mouth twitched as if she might have something to say, but she bit back the words. She had a light dusting of freckles across her nose—very unfashionable—and they no longer stood out on too-pale skin. She stared at him for a moment, her gaze direct, leaving him uneasy, feeling as if she could see through to his thoughts, to the old hurts that he took care to hide from the world. But that was only a fancy, for she pokered up again with proper manners. He let out a breath. If she had pressed, he would have resisted, but this sudden capitulation—this retreat—left him with the ingrained desire to pursue. A withdrawal needed to be followed. However, he kept his tone flippant—he wanted his options left open. He poured brandy for himself, almost poured her wine, but thought better of it, so a splash of brandy to steady her nerves as well. He brought the glasses back, put them on a side table where the sharp aroma wove into the room along with the comfort of wood smoke. He settled himself on the couch next to her, and thought she looked to be carrying on an internal debate. She sat with her hands tightly intertwined, her eyes downcast, and a frown tugging her brows flat on her forehead. He almost reached out to smooth the lines forming, but he wasn’t quite certain of his ground yet. Always best to scout the area before choosing to engage in a skirmish. Stretching out his bad leg, he took up his brandy and sipped. Ah, good to see Ian hadn’t drunk the cellars dry of the good French cognac. The golden liquid warmed his insides like a Guy Fawkes bonfire. He couldn’t let such drink go to waste. Picking up the second glass, he nudged her arm with it. She glanced at it as if he was offering poison. “You may trust me on one thing—this will help,” he said.